Hello and welcome to another installment of Mastication Monologues! Today’s review is going to be short and sweet since I have to actually ready for a big week of teaching. Tomorrow a new co-teacher is starting with me, and I’m quite scared since she doesn’t have any teaching experience or experience with children. Well, at least I had a great meal today with great memories I can savor when things are possibly going downhill in the classroom. My friend Steph and I went to Seoul to see the Tim Burton art exhibit, and it was quite the experience. There were sooooo many people, but overall it was a fun time. Eventually all of that walking got us really hungry. So Steph asked me what I wanted to eat. I might have wanted to try a new galbi place, but I really had a craving for a legit burger. 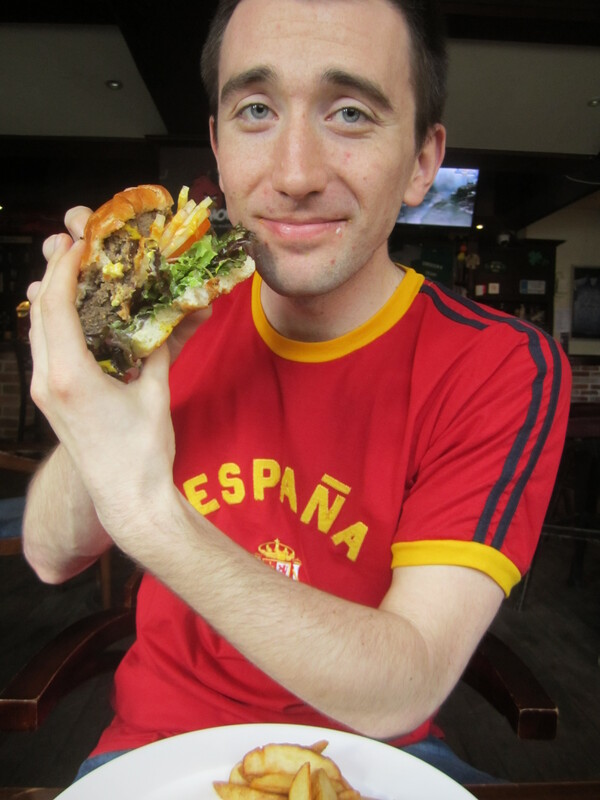 Therefore, we headed to Itaewon to The Wolfhound which apparently has the best burger in Seoul. Now that might not be saying much since there aren’t many legitimate burger restaurants outside of Itaewon, but I’m always down to try new places. It was down a side alley, but upon walking in it was like any normal Irish pub themed restaurant/bar in the States. There was no one in the place, so it was nice to get away from the insane crowds we had to battle just to see an original sketch from the Nightmare Before Christmas. There were a lot of great options on the menu, but I decided to go for the Big Paddy burger (about 12 bucks) since I probably wouldn’t be coming back to the restaurant in a very long time or ever again. It came out, and I was genuinely impressed. I could see why it is considered the best burger in Seoul. It had a legitimate slab of beef for a patty, cheese, bacon, garlic mayo, and a hefty helping of veggies. Plus, it came with steak fries on the side. In Korea, those are probably as rare as a Coelacanth. Anyway, I quickly got down to business since I hadn’t eaten since 8:30 in the morning. 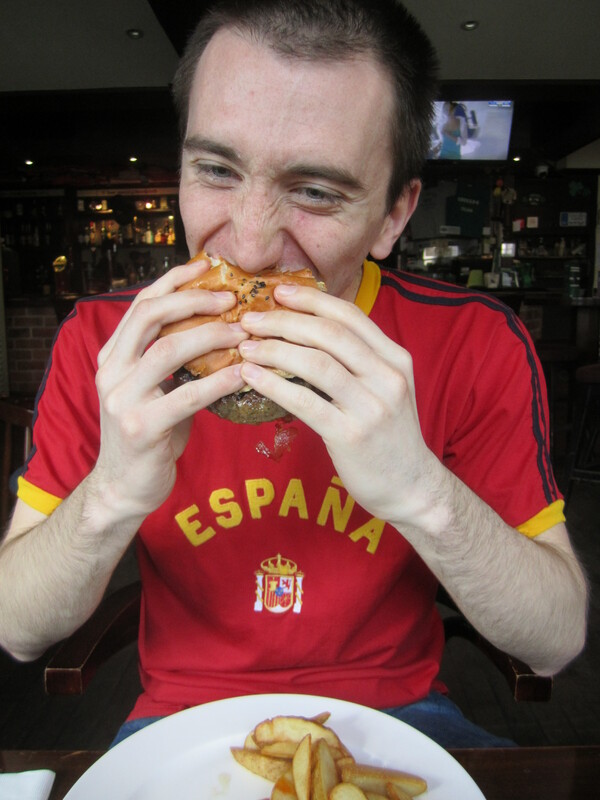 Upon sinking my teeth into the gargantuan burger, I was pleasantly surprised by the beef since it was well seasoned with a definite peppery aftertaste. The bun was light but did not buckle under the pressure of the burger’s contents. I also really enjoyed the onions, tomatoes, and lettuce since all were really fresh and were not playing second fiddle to the beef. The bacon was also pretty good since it was western style with some seasonings on it, and it was cooked to a semi-crispy state. The staff also provided us with pretty standard condiments like ketchup, mustard, mayo, A1 steak sauce, and Tabasco sauce. The steak fries didn’t disappoint either. They were very fresh, not too salty, and had fluffy white interiors. Overall, this was the best burger I’ve had so far in Korea and closest to the American standard in terms of taste, size, and just overall quality. 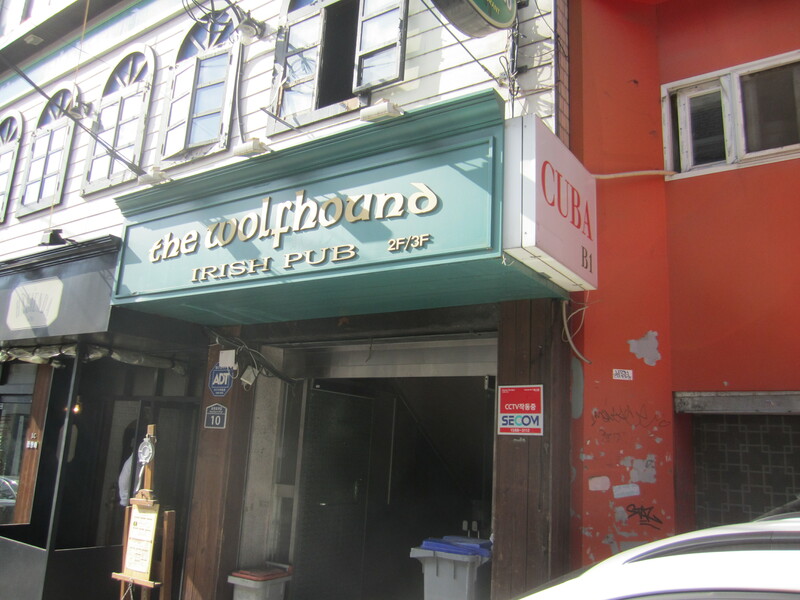 So if you want a break from kimchi and seaweed, head on over to The Wolfhound for a little piece of the West in the Far East. 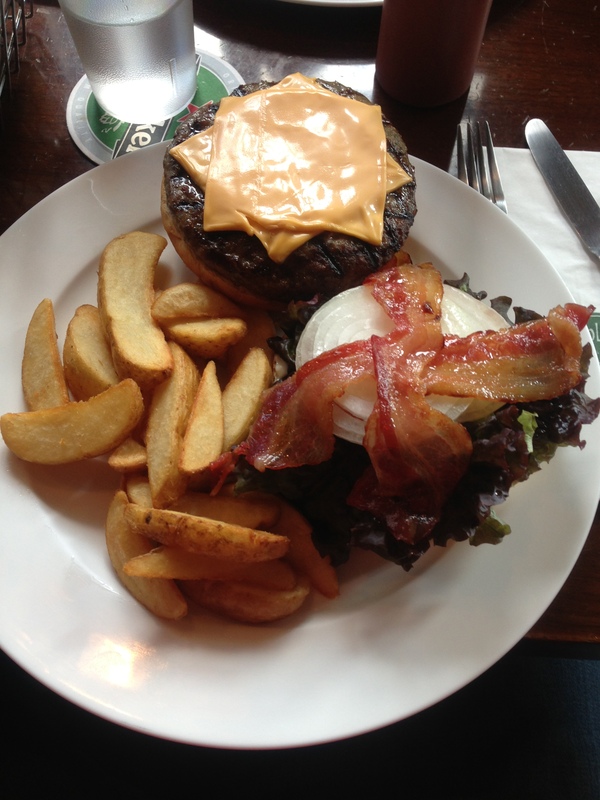 Posted in American Cuisine, Burgers and tagged authentic, Bar, bread, Burger, cheese, dining, Food, French, fried, garlic, hamburger, Korea, lettuce, mayo, onion, potatoes, restaurant, Reviews, Sandwich, sauce, Travel, wolfhound. Bookmark the permalink. I want to try that place when we go in July. Around 8/1/13, I will be craving a burger after 8 days there. I know it will taste delicious! It looks great.